2. MISSION "SHORTY": Complete as many rounds as possible in 20 minutes: 21 deadlifts, 15 overhead squats, and 9 thrusters. (1) Intent. Complete the exercises in order, as quickly as possible, in a safe manner. This is a four-person-team, "time-specific" workout. The purpose of this workout is to develop cohesion and combat fitness under fatigue conditions through shared hardship, challenges, and competition. (2) Scheme of Maneuver. The platoon will be divided into as many teams of four as possible. Each team will require two .50-cal ammo cans for deadlifts, four 6-foot pickets for overhead squats, and one 25-mm ammo can for thrusters. All teams will start at the same time. Each soldier will complete as many rounds of the prescribed exercises as he can in 20 minutes. One soldier from each team begins with the deadlifts; after completing 21 reps, he moves on to the overhead squats, and the next team member begins deadlifts. Ultimately, all team members will be working their way through the rounds at the same time but at their own pace. 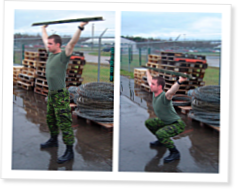 The soldiers will complete the exercises in order; they must finish the deadlifts before starting the overhead squats and then finish the overhead squats before starting the thrusters. Evidence suggests CrossFit is more effective than traditional military and law enforcement physical training (PT), Coach Greg Glassman wrote in December 2004. These are excellent austere workouts. My platoon will be doing these in garrison as well. I would like to incorporate some professional military education as well as esprit de corps by having one of my NCOs talk about the individuals who these workouts are named after before each workout. Can you provide a list of names and ranks of these 13? I can have them conduct research from there, unless you can provide further information on each. Thank you very much.